There’s a delightful trend, just now, for beautiful books. Bound between linen-covered boards, some engraved, some gilt-edged, many with silk place-markers, they recall a time when print books were given as precious gifts, and treasured by their owners. 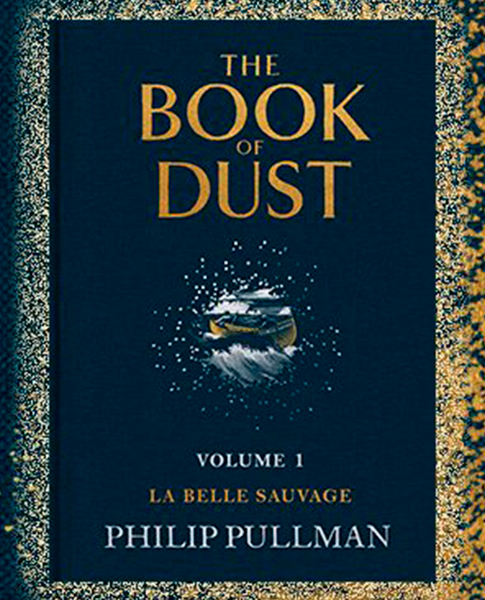 The Book of Dust is one such treat, gorgeous in dark blue with sprinkles of gold: a reference to the cosmic ‘Dust’ of the title, which is such an important element of Pullman’s original trilogy. La Belle Sauvage opens a new trilogy, with Lyra Belacqua, although an infant, still at the centre of the story. As a flood of apocalyptic proportions threatens the country, ten-year-old hero Malcolm and fifteen-year-old Alice set out on a quest to place Lyra under her father’s protection. More ea rth-bound than its predecessors this prequel to Northern Lights chronicles the awakening – or more accurately – the reestablishment of magic in the Oxford/not Oxford parallel universe Pullman created for His Dark Materials. Dæmons – the spiritual-animal alter egos of humans – feature, and as before, they are not explained. As a natural part of the world they inhabit, they are literally un-remarkable, so when Malcolm comments on the hyena dæmon of Bonneville, a stranger in town, he is remarking upon the man’s dangerous nature. 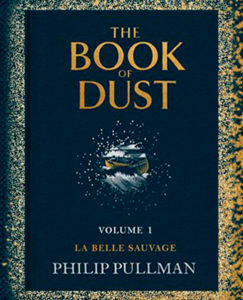 La Belle Sauvage is richly populated by multifaceted characters of depth and humanity, many of whom are not what they seem, and this makes for a thrilling adventure for Malcolm and Alice, fighting to keep the infant Lyra safe as the waters rise and they are pursued by their terrifying adversary.